(Dallas, Texas) — Batman beats Superman. The Caped Crusader is pounding the Man of Steel – and the recession – in an auction. A rare copy of the first Batman comic book has far surpassed the previous comic books record price, $317,000, paid for a first Superman comic, and the bidding is still underway with Batman already at $418,250. Super heroes and pop culture fans will learn the final, new record price when the auction ends in two weeks. 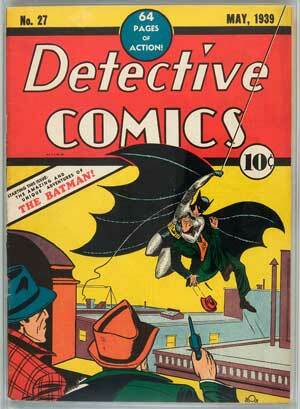 Heritage is selling the Batman comic on behalf of an anonymous consignor. “Today, due to the popularity of the movies, cartoon and toys, Batman would seem to be the more popular pop culture character, and now he’ll dethrone Superman as the most valuable comic book,” said Allen. For additional information, contact Heritage Auctions at (800) 872-6467 or visit online at www.HA.com. NOTE: We first reported on a copy of Detective Comics #27 which sold in a private sale back in 2007 for an undisclosed amount, but was valued at $250,000 then.